Elegant Villa w/ Breathtaking Sunsets, Infinity Pool & WI-FI ~ 2017 LOWER RATES! DOMUS GRATIA is an elegant villa located at 700 meters above the Park of Titignano with views to the mountains, Tiber Valley, and pastures. The villa is all stone, well furnished and equipped with all appliances, linens, cookware, tableware. Private, gated, and fenced property of 5 acres with olive groves, 1000 year old olive tree, manicured lawns, tended gardens, terraces. 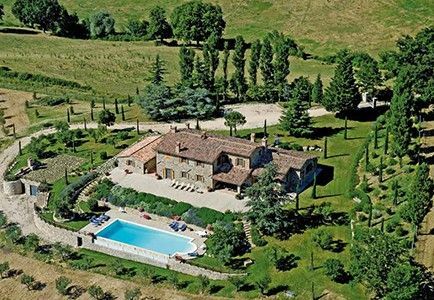 Wide patios lead to the infinity pool with 180 degree panorama of the Umbrian countryside! Newly restored with exposed ceiling beams, handmade terracotta floors, marble floors in bathrooms, natural light throughout, spacious rooms, all with a view. GROUND FLOOR: Large designer kitchen w/ fireplace, Prep kitchen/laundry, Spacious dining room, Living room w/ fireplace, Family room, Entry/Card table area, Half bathroom, Bedroom suite w/ bathroom, Portico and patio areas, Courtyard w/ outdoor brick oven. UPPER FLOOR: 3 bedroom suites each w/ full bathroom, Open sitting area. ANNEX: 2 bedroom suite w/ shared bathroom. Distances from the villa:: *4 km. to Casemasce with 2 small groceries, 2 bars for morning cappuccino and pastries, gas station, garbage and recycling bins. * km. to horseback riding in . * km. to Ponte Rio. *12 km. to Todi / 20 minutes by car. *24 km. to Orvieto / 35 minutes by car. *2 hours to Rome Airport (Fiumicino). Comforts of the villa:: BEDS: All the beds in the villa have orthopedic mattresses. Our guests will awake refreshed from a pleasant night's sleep! BED PILLOWS: All the bed pillows were specially ordered from the same mattress company to assure a comfortable rest. *2 BABY PLAYPENS + 1 HIGH CHAIR available. Please request in advance. NOTEBOOKS WITH INFORMATION: Recommended journeys throughout Umbria and southern Tuscany, restaurants, shops, wineries, weekly outdoor markets, festivals, menu for catered meals, appliance instructions. BICYCLES: 2 Bicycles, on site, for rent. 50 euros per week per bicycle. Please reserve in advance. Payable on arrival in euros in cash. ***US $ RATE GUARANTEED ~ 50% LOWER THAN EUROS! ***COMPLIMENTARY *Wine and *extra virgin olive oil, as well as *fresh vegetables and *herbs from the garden. Additional *extra virgin olive oil available for purchase. Michael and Grace, a couple from New Jersey, lived in Bologna five years after they were first married. After returning to the USA, their hearts remained in Italy, having savored 'la dolce vita.' Both of Italian heritage, their fathers and numerous relatives born in Italy, it was their dream to plant roots in their native land. In 1998, their dream became reality when they purchased Santa Cristina. The renovation was such a positive experience that they purchased Domus Gratia in 2003. Michael and Grace produce olive oil exclusively from the 1000 olive trees on their properties, as well as red and white wine from their vineyard. Vegetables, rosemary and sage are cultivated on both properties for enjoyment by their guests. Michael and Grace enjoy traveling to Italy with their children, parents, relatives and friends. The villas are splendid for celebrations and gatherings. They welcome their guests with open arms. Mario, Giuseppina and Elena are their staff. Mario is a professional farmer, caring for the olives and the vineyard, as well as maintaining the villas, green lawns, flowers and the pools. Giuseppina caters delicious meals upon request, and does a superb job keeping the villas spotless, and bed linens and towels fresh. Elena speaks English, welcomes the guests at arrival, facilitates check out at departure, assists with the catered meal service, and is able to babysit upon request. Come.....Experience Italy and 'la dolce vita!' Welcome! Benvenuti! toilet, combination tub/shower, bidet, 2 sinks. Heated towel rack (when heat is on). toilet, shower, bidet, Large walk-in marble shower. Heated towel rack (in winter). toilet, bidet, Heated towel rack (when heat is on). All bathrooms have heated towel racks (when the heat is on). Vegetable garden with herbs and vegetables, rosemary, lavender, sage. Gorgeous, colorful roses. Brightly colored flowering plants. Green lawn. New portico, lit at night, perfect for outdoor dining. Outdoor dining table and benches, handmade in Deruta. Stone barbecue located on this stone terrace. Antognolla Golf near Perugia. www.antognollagolf.com 18 holes, designed by Robert Trent Jones. GROUND FLOOR: LARGE GOURMET KITCHEN includes 6 burner stove w/griddle and 2 ovens; refrigerator-freezer; dishwasher; cooking level fireplace; marble work island, counters, sink; professional cookware; all kitchen equipment. PREP KITCHEN/LAUNDRY includes work island, marble sink, storage cabinets, washing machine and dryer. DINING ROOM has arched glass doors for optimal views. LIVING ROOM with fireplace. FAMILY ROOM with CD player, satellite tv. ENTRY/CARD TABLE AREA for writing and games. BEDROOM w/queen bed, full bathroom w/bathtub, hand-held shower. UPPER FLOOR: 1st BEDROOM w/queen bed, twin day bed forms a queen bed, full bathroom w/large shower, fireplace. 2nd BEDROOM w/2 full beds, full bathroom w/corner tub and wall shower over tub, fireplace. 3rd BEDROOM w/queen bed, full bathroom with shower, wood-burning stove. OPEN SITTING AREA at top of stairs. ANNEX: 1st BEDROOM w/queen bed. 2nd BEDROOM w/2 full beds. Bathtub w/hand-held shower. **Heated towel racks in all bathrooms. DOMUS GRATIA is ideally situated for visiting Umbria and Southern Tuscany: Todi, Orvieto, Perugia, Assisi, Spello, Trevi, Gubbio, Spoleto, Deruta, Montefalco, Amelia, Bevagna, Lake Trasimeno, Lake Bolsena; Montepulciano, Pienza, Cortona, Montalcino. It is located near the E-45 Superstrada to all Umbrian destinations, and the A-1 Autostrada del Sole to Rome (1.5 hours) and Florence (2.5 hours). *4 km. to Casemasce with bars, groceries, gas station. * km. to Ponte Rio with shops, gas station, restaurant, groceries, Bank, Tudernum Winery, jeweler, fresh cheese shop, housewares . *12 km. to Todi / 20 min. by car *24 km to Orvieto / 35 min. by car.